Hannah was born in Paisley and studied Law at the University of Glasgow before pursuing her interest in art and antiques with a post-graduate Masters course in Collecting and Provenance, focusing on the art market and the history of collecting. During this time Hannah also worked at the University’s Hunterian Museum and Art Gallery, where she developed a lasting love for the work of James McNeill Whistler. 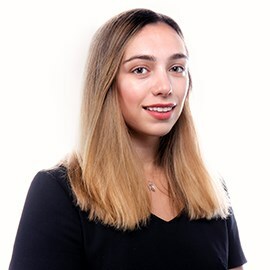 Since university, Hannah has worked as a Legal Research Assistant at a Glasgow law firm and worked with the Institute of Art and Law in London. Hannah joined the McTear’s Valuation Team in December and enjoys the huge variety of treasures which walk through McTear’s doors every day. In her spare time, Hannah loves exploring Glasgow’s art galleries, museums and restaurants and walking her two dogs, Brodie and Daisy.